Gravitational lensing is an awesome natural phenomena that allows us to study the farthest and oldest structures in the Universe. It happens when mass within a certain volume reaches the critical density needed to curve space and time. The higher the density, the more dramatic the warping the Universe experiences; therefore we expect to find strong gravitational lensing in areas where galaxies join in groups or clusters. Such huge ensembles are made up of dozens to hundreds of galaxies, each with billions of stars. Yet, not even by adding up all the mass of trillions of stars would we have enough mass, and therefore density, to warp space and time. We need dozens to hundreds of times more mass than what we detect to create the lensing effect we see through telescopes. That's where dark matter comes in, an exotic form of matter that interacts with the Universe only in gravitational form and that theory and observations show exists in huge quantities around galaxies. Put several galaxies together and you have an exorbitant amount of dark matter in a cluster that is enough to create these space-time distortions. So how does curved space and time look like? See Figure 1. Remember that because light travels at a finite speed, we see more distant objects as they were farther into the past. Now, put a light emitting object in your mind far, far away. There are a couple of factors that might limit us from detecting the light from that object: 1. something might come between us and that light-emitting object, blocking its light; 2. the amount of light it might be emitting could be very little, being too dim to be seen when placed too far away. Now, substitute your light-emitting object for a galaxy, it has stars and therefore emits light, but a huge intergalactic cloud of dust or gas might come between us and we might never see it, or it may have too few stars to be bright enough to be detected. That's where gravitational lensing plays an important role. Figure 1. Warping of space and time thanks to a galaxy cluster midway between us and a background (and faraway) source of light. Credit: NASA/ESA. Between us and that faraway galaxy the alignment of the Universe might be such that a cluster of galaxies will cross our direct line of sight, rich with dark matter clustered in a cosmologically-small volume, thus warping space and time. What the warping will do is re-direct particles of light (photons), which we would otherwise miss, towards us, enabling us to detect the light from that distant galaxy. It will also magnify, acting as a lens, the background galaxy, distorting it and artificially increasing the area it covers in the sky. We therefore have a twisted, bright image from our very distant, very old object. 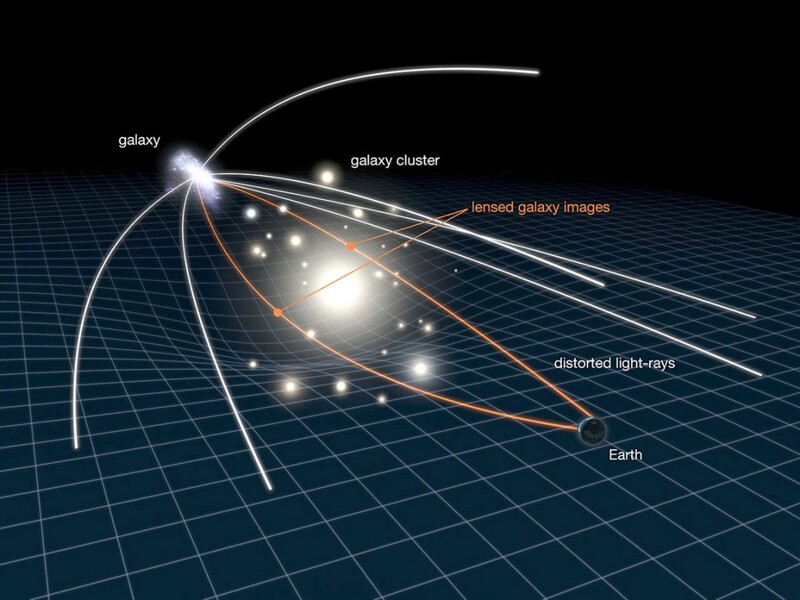 Gravitational lensing has been heavily used to research primordial galaxies for the past two decades. 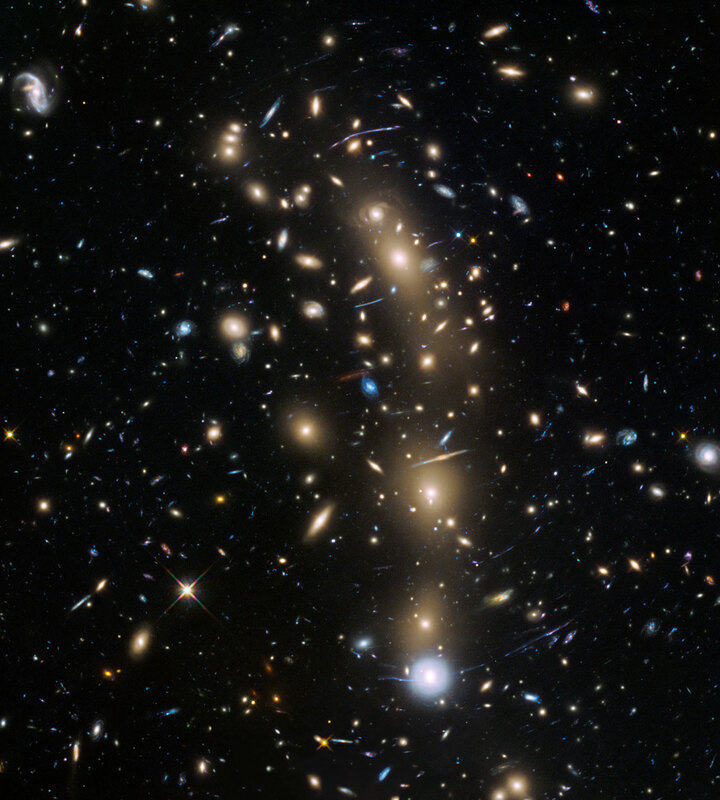 But just recently, a new research observation by an international team of astrophysicists using the Hubble Space Telescope has lead to the discovery of the largest sample of the faintest, smallest, and earliest known galaxies in the Universe. Some of the these early galaxies, lensed by foreground cluster MACSJ0416.1-2403 (Figure 2), were formed just 600 million years after the Big Bang. If you take into account the Universe is 13.8 billion years old, we are peaking very early into its history. Two hundred and fifty background galaxies are lensed and detected through this particular cluster. Figure 2. Hubble Frontier Fields view of MACSJ0416.1-2403. Credit: NASA/ESA/HST Frontier Fields team (STScI). The study of these very early galaxies helps us understand an epoch in the Universe known as 're-ionization', when it becomes fully transparent instead of a hot dense foggy soup of rapidly moving particles. Big galaxies previously studied at this epoch cannot account for the physical processes required for transparency. Astronomers have long thought dwarf galaxies (which are much more numerous) could hold the key to explaining how transparency came to be. Main author Atek explained, "If we took into account only the contributions from bright and massive galaxies, we found that these were insufficient to re-ionize the Universe. We also needed to add in the contribution of a more abundant population of faint dwarf galaxies." in the European Space Agency's news bulletin. Theses studies were made possible through long observation periods of the Hubble Space Telescope to detect the faintest possible lensed galaxies embedded within gravitationally lensing clusters. The Frontiers Fields survey has produced amazing results helping humanity understand the first cosmic structures that formed in the Universe, breaking new records in distance and age with each data release.